I love festivals, planning the menu for a festive feast and especially look forward to try sweet treats that I’m yet to blog. 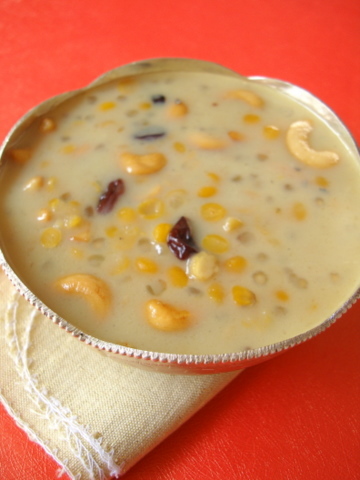 Senagapappu Payasam is a traditional South Indian sweet dish that I prepared for our Ugadi festive meal. This lentil based sweet dish incorporates the same ingredients that you’d find in a regular Payasam – jaggery, milk or coconut milk and cardamom powder. The star ingredient in today’s recipe is chana dal (Bengal gram) along with sago. 1 Heat a pan, add ghee and toast the cashew nuts and raisins till golden brown. Remove from pan, keep aside. 2 In a heavy bottomed vessel, add the jaggery water and let it cook for 7-8 mts on low flame. 3 Add the cooked chana dal and sago along with left over liquid and let it slowly simmer for 6-7 mts, stirring it once in a while. 4 Turn off heat. Add the low fat milk and combine. On low flame, allow the payasam to simmer for 4-5 mts. Add the cardamom pwd, toasted cashews and raisins. Serve warm or refrigerate until chilled. It tastes good both warm and chilled. Awesome. I am having a Pooja at home this Saturday, timing baby. Sailu, a new recipe for me, a new combination, looks yummy !!! what is the propotion of water in which the channa dal is soaked. Should it be cooked to a paste? btw the pic looks fabulous and mouth watering…. Add two cups of water to one cup chana dal. The dal should hold shape and soft on bite. Does the saggubiyam not be soaked before we boil it in water till transparent? i think if its not soaked it might take longer to cook. Pls advice. You can soak for half an hour or so in water and then cook. Thanks for informing me, Latha. This person has copied a lot of content from my blog as well as from other blogs. Unfortunate. a very nice recipe, Sailu. And you’ve explained the method very well. I fried the sago in ghee for a while and then cooked. Hi.. Can we make the same recipe with vermicelli instead of sago? Yes, you can use vermicelli. Very good recipe as naivedyam. I like coconut flavour. Can we add coconut at the end to this recipe?